On February 7, 2017, after a period of heavy precipitation, a large hole developed in the Oroville Dam’s concrete-lined primary spillway that connects Lake Oroville to the Feather River below. The damaged spillway allowed water to erode the earthen dam and carry debris that could potentially damage downstream infrastructure and power lines. 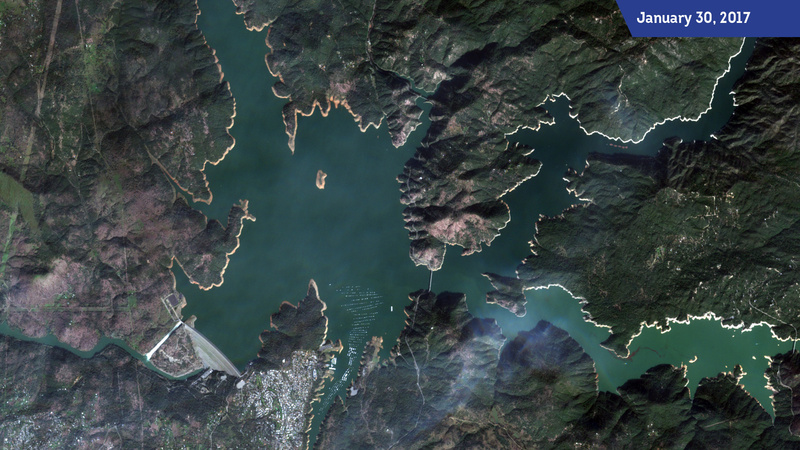 Ultimately, dam officials decided to slow the rate of water exiting Lake Oroville confident that the flow would still keep the water level below acceptable limits. While high water levels are not an unfamiliar sight at Lake Oroville, they’ve never reached the height of the dam’s emergency spillway in its nearly 50 years of operation. The emergency spillway is designed to overflow when the primary spillway cannot lower Lake Oroville’s water level fast enough to prevent it from overflowing the dam itself. Several days after the initial incident, the dam’s emergency spillway began to overflow. The emergency spillway dumps water directly into the Feather River down a large embankment. Unlike the primary spillway, the emergency spillway lacks a concrete lining and caused the hillside to erode faster than officials expected. The following day, an evacuation was ordered displacing nearly 200,000 people along the Feather River below the Oroville Dam. Now, on February 16, the Oroville Dam seems to be largely under control, but wet weather is expected in the coming weeks which could again strain Oroville Dam’s capacity. 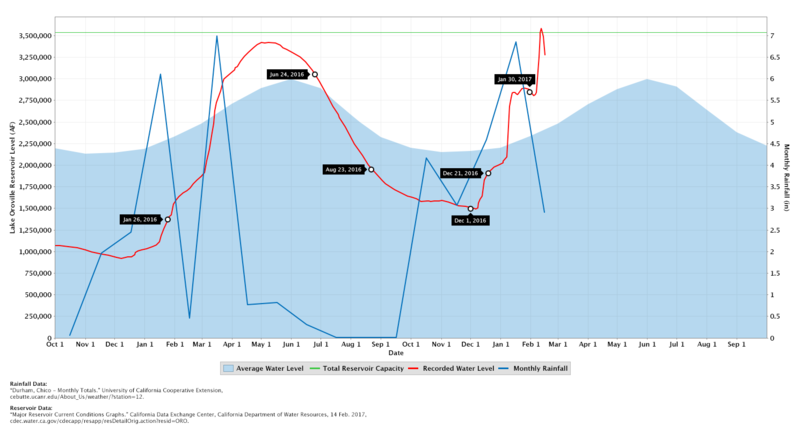 What follows is a comparison in water levels between two similar dates, a year apart, of Lake Oroville. The clear waterline differences between the dates show the Oroville Dam entering the wet seasons with substantially more water than the prior year. 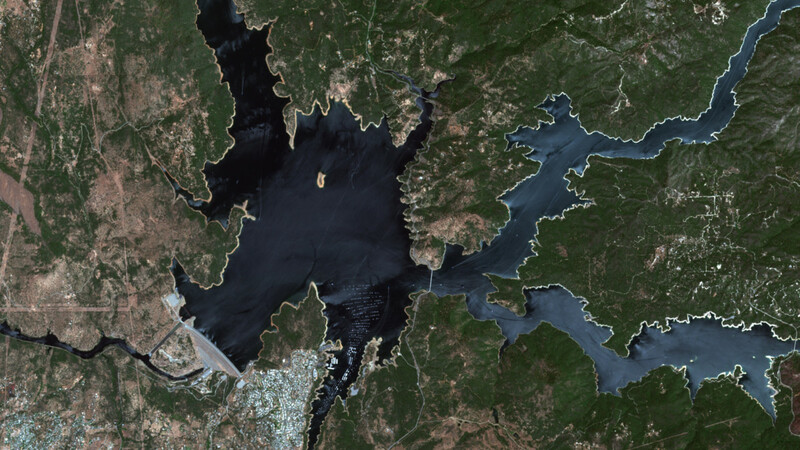 We were able to obtain six images over the past year from the European Space Agency’s Sentinel 2 satellite. 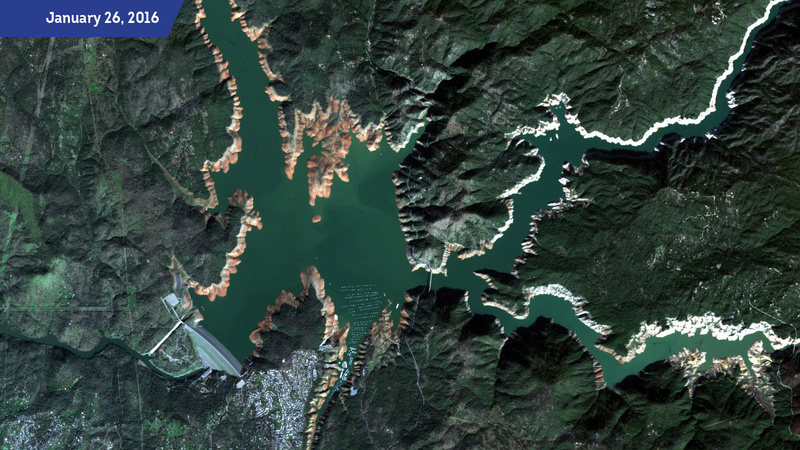 The images clearly show the differences in the Lake Oroville water line at different points throughout the year. Our January 30 image, as of February 16, was the latest photo we could get due to cloud cover (presumably in concert with the increased rainfall that occurred around the same time). If you watched the time-lapse as closely as we did, you’ll notice on June 24, 2016, the water level was actually higher than it was on January 30, 2017. Curious, we gathered precipitation and Oroville Lake data to plot the exact ebb and flow or the Oroville Lake water level and how it relates to rainfall. You’ll notice from the graph that the months leading up to the 2017 incident had much more sustained rainfall—the data for February 2017 is only through the 14th. With more rainfall on the way, dam officials remain cautiously optimistic, and we’re all hoping for speedy repairs and a safe return for area residents.